The tornadoes that swept across the mid-South on Tuesday and Wednesday illustrate in tragic fashion the findings of a recently published study by Northern Illinois University meteorologist Walker Ashley. 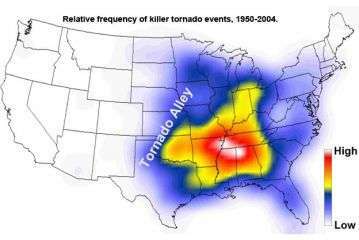 Ashley found that while the “tornado alley” region of the Great Plains boasts the most frequent occurrence of tornadoes, most tornado fatalities occur in the nation’s mid-South region, which includes parts of Arkansas, Tennessee, Alabama and Mississippi. “The country’s most vulnerable region for tornado-related fatalities and killer tornado events basically stretches from Little Rock to Memphis to Tupelo to Birmingham,” Ashley said. Earlier this week, tornadoes swept across the South, killing more than 55 people in Tennessee, Arkansas, Kentucky and Alabama and injuring hundreds. -- Nighttime tornadoes. The southeast United States has a higher likelihood of killer nighttime tornadoes. Most states within this region have greater percentages of tornado fatalities occurring at night than other states.“I just completed another study that shows tornadoes from the midnight to sunrise period are 2.5 times as likely to kill as daytime events,” Ashley said. Further, nocturnal tornadoes are more difficult to spot, and people are more likely to be asleep when warnings are issued. -- Forested areas. Whereas regions within the Great Plains by definition are lacking in tree cover, the mid-South region is more forested, leading to reduced visibility both for the public and spotters. -- Early season storms. Storms that occur before the national peak in the severe storm season, which spans May and June, may catch people off guard during a tornado event. Complacency. In contrast to other parts of the country, the South lacks a focused “tornado season,” which can lead to complacency. “In the South, people think tornado alley is where you get tornadoes,” Ashley said. “That sort of perception also leads to complacency, which in turn leads to higher fatality rates.” He points out that Oklahoma is known worldwide for the frequency of its tornadoes. Yet the state has fewer fatalities than Arkansas, Alabama and Mississippi. Lots more basements in Oklahoma than the rest of the belt. Most mobile homes don't have a storm cellar, which can be built for less that $10K, which is cheap insurance.